The Kontinental Hockey League may withdraw its players from the Pyeongchang Olympics in protest at doping investigations into Russian athletes, the league president suggested on Saturday. Canada’s current Olympic roster includes 15 players from the KHL including goalie Ben Scrivens (Salavat Yulaev Ufa) as well as forwards Wojtek Wolski (Kunlun Red Star), Brandon Kozun (Lokomotiv Yaroslavl), Eric O’Dell (HC Sochi), and Matt Frattin (Barys Astana). That team begins play in the Karjala Cup in Helsinki, Finland, starting Wednesday. In a statement, KHL president Dmitry Chernyshenko said the International Olympic Committee “is destroying the existing world order in sports” by pursuing doping cases against Russians in other sports who are suspected of using banned substances around the time of the 2014 Winter Olympics in Sochi. IOC commissions “suspend athletes without a basis of real facts confirming doping,” Chernyshenko said. A Russian gold medallist in cross-country skiing was stripped of his title by an IOC panel on Wednesday using evidence of Russian doping coverups and tampering with sample bottles. Chernyshenko previously headed Russia’s organizing committee for the Sochi Olympics, where Russia has since been accused of operating a state-sponsored program of drug use and cover-ups. Russians were being unfairly targeted by the IOC, Chernyshenko said. He referred to a recent speech by Russian President Vladimir Putin in which Putin accused the U.S. of lobbying the IOC for Russia’s exclusion from the Pyeongchang Olympics or trying to force IOC officials to make Russians compete under a neutral flag. If it were not for the spectators chanting in Chinese, the intense scene at the skating rink at Beijing’s Joy City shopping mall on Oct 28 could easily have been at an ice hockey game in North America. The yelling of the junior players coupled with the sounds of skates cutting hard on the ice and the shoulder pads colliding easily attracted passers-by at the world-standard rink, where the opening game of the Beijing Minor Hockey Leagues 2017-18 season took place. The junior league, initiated by the parents of around 60 hockey-loving children in 2008, has developed into the biggest of its kind in Asia with 2,554 players from 162 teams registered with the Beijing Hockey Association to compete in five age groups, from under-6 to under-14, this season. The rise of junior ice hockey in the Chinese capital has underlined the surging popularity of winter sports as a whole, driven by the country’s commitment to involve 300 million people in winter sports activities in the lead up to the 2022 Beijing Olympic and Paralympic Winter Games. As urged by General Secretary Xi Jinping at the opening session of the 19th National Congress of the Communist Party of China last month, preparing for the 2022 Olympics while raising the profile of winter sports is a top priority for the country’s sports governing body. Gou Zhongwen, minister of the General Administration of Sport of China, called for full support from the country’s sports sector in order to further promote winter sports. “The winter sports sector remains underdeveloped in our country. We shall invest in building more facilities and conduct better promotion to boost winter sports participation to new heights,” he said. Despite a late start compared to winter sports powers in the West, infrastructure upgrading in recent years has turned winter sports from a niche interest isolated to northeastern China into a mass sporting activity widely embraced across the country. When Song Andong, the first Chinese player drafted in the North America-based National Hockey League, started to learn the sport in early 2000s, he had to share a small rink with children practicing figure skating, as it was the only facility available in downtown Beijing. Now there are around 30 indoor rinks in Beijing and 66 more will be built by 2022, according to the Beijing Municipal Sports Bureau’s winter sports development plan. “The change has been dramatic in recent years, especially since Beijing’s successful bid for the 2022 Olympics. Skating is now an accessible exercise for kids in Beijing,” said Song, who was selected by the New York Islanders in the 2015 NHL Draft. At the elite level, international competition is now part of the life of urban winter sports fans across China, even in the south. After staging the NHL’s first ever China game between the Los Angeles Kings and the Vancouver Canucks in September, Shanghai is now hosting a stretch of home games of the Kunlun Red Star men’s team in the Russia-based Kontinental Hockey League. Meanwhile, the club’s female squad will kick off a four-game home run in the Canadian Women’s Hockey League in Shenzhen, Guangdong province. Kevin Westgarth, NHL vice-president of business development and international affairs, said the consistent exposure to high-level competition will help increase the appetite for winter sports. Meanwhile, skiing has become a major outdoor leisure activity in China. As one of the most-visited skiing destinations in China, Wanlong Ski Resort in Chongli, a county in Beijing’s 2022 co-host city of Zhangjiakou in Hebei province, was busy preparing ski slopes and testing cablecars over the weekend to prepare for the 2017-18 snow season. Featuring 22 slopes, the resort received 450,000 skiers in the 2016-17 season and is expected to serve more than 600,000 this year, according to Wang Lin, manager of its service department. “It’s a challenge for us to upgrade our facilities and services to meet the growing demand from skiers,” said Wang. Since winning the joint bid with Beijing to become the host of all snow events of the 2022 Winter Olympics, major resorts, including Wanlong, have been built in Chongli, bringing the total there to seven. More than 2.6 million skiers visited the county last winter, generating total revenue of 1.89 billion yuan ($285 million). Still, the country has set its sights on bigger gains by rolling out an ambitious winter sports development plan. China aims to build a total of 650 skating rinks and 800 ski resorts by 2022, laying the foundation for the winter sports sector to generate industry value of 1 trillion yuan from spending at venues, equipment production and training fees by 2025, according to the plan unveiled at the end of 2016. China had 646 ski resorts in operation and 11.3 million skiers, who ski at least once a year, by the end of 2016, according to the annual report on the development of the ski industry in China. 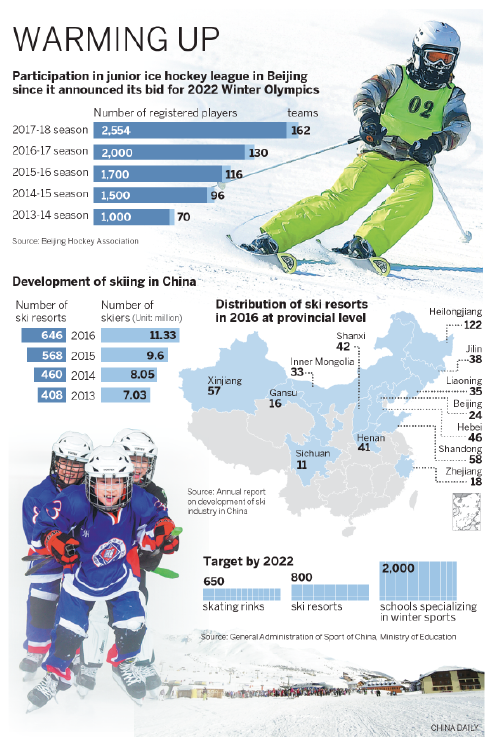 The plan also called for expanding winter sports education to 2,000 schools as part of their PE curriculum by 2022, while Beijing alone has selected 52 schools for a pilot program to offer such training at local rinks and resorts. Despite the government push, observers warn that promotions should be cautiously implemented with integrated thinking and planning in staff training, construction design and environmental protection. “To avoid a waste of resources after the Olympics, local governments should take tourism, infrastructure and education plans into consideration,” said Yang Hua, a sports sociology expert from Beijing Sport University.